Mental health, especially children's wellbeing, is an important issue for the Duchess who last month, also launched Mentally Healthy Schools, a program in the United Kingdom that will provide online resources for teachers and school staff to help students struggling with the challenges of growing up. She made her remarks in footage especially recorded for children's mental health charity Place2Be, as part of Children's Mental Health Week 2018. 'Be yourself' - that's the simple message from Kate Middleton, for children trying to find their place in the world. The theme of the new campaign, which runs through February 11 and was created by Place2Be, is "Being Ourselves". 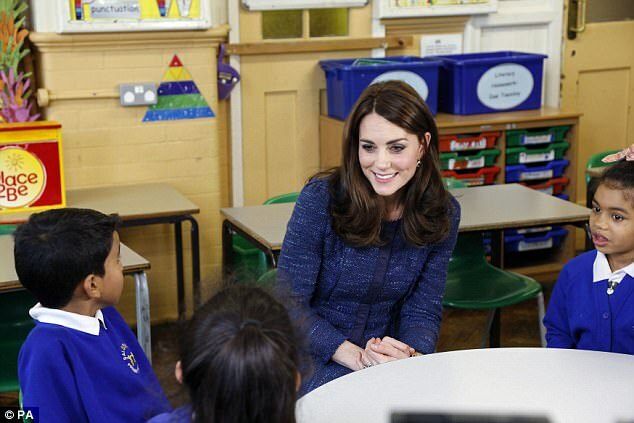 The Duchess said: "Childhood is an incredibly important moment in our lives". The video message was filmed last month at Middleton's visit to the Reach Academy, and she's wearing her blue printed Seraphine maternity dress, which she has recycled several times throughout her pregnancies. According to Place2Be, low self-esteem affects more than eight in 10 of the pupils who get Place2Be's one-to-one help with some children reportedly compare themselves negatively to others, particularly online. In the PSA, Kate encourages parents, school administrators and teachers to support children as they learn to express their individuality. The theme of this year's Children's Mental Health Week is Being Ourselves, aimed at helping youngsters to feel comfortable with who they are. 'We'll all face hard times in our lives, but helping children to have a positive view of themselves can help them find the inner strength and resilience to cope with those challenges'. "We'll all face hard times in our lives, but helping children to have a positive view of themselves can help them find the inner strength and resilience to cope with those challenges". "Some children will be facing tougher challenges than others, but I firmly believe that while we cannot change their circumstances, we can ensure that every child is given the best possible support to ensure they fulfil their true potential", she continues. Kate is the mother of Prince George, 4, and Princess Charlotte, 2, who both recently started school themselves. Over the past few years, Kate, as well as her husband Prince William and her brother-in-law Prince Harry have increasingly focused on working to reduce the stigma of mental illness.